This help controller provides an easy way of displaying HTML help in your application (see HTML Sample, test example). The help system is based on books (see wx.html.HtmlHelpController.AddBook ). A book is a logical section of documentation (for example “User’s Guide” or “Programmer’s Guide” or “C++ Reference” or “wxWidgets Reference”). The help controller can handle as many books as you want. 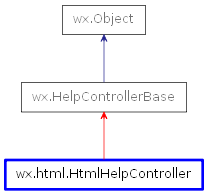 Although this class has an API compatible with other wxWidgets help controllers as documented by HelpController , it is recommended that you use the enhanced capabilities of wx.html.HtmlHelpController‘s API. HTML uses Microsoft’s HTML Help Workshop project files (.hhp, .hhk, .hhc) as its native format. The file format is described in Help Files Format. The directory helpfiles in the HTML Sample contains sample project files. Note that the Microsoft’s HTML Help Workshop (http://www.microsoft.com/downloads/details.aspx?FamilyID=00535334-c8a6-452f-9aa0-d597d16580cc) also runs on other platforms using WINE (http://www.winehq.org/) and it can be used to create the .hpp, .hhk and .hhc files through a friendly GUI. The commercial tool HelpBlocks (http://www.helpblocks.com) can also create these files. AddBook Adds a book (i.e. CreateHelpDialog This protected virtual method may be overridden so that when specifying the HF_DIALOG style, the controller uses a different dialog. CreateHelpFrame This protected virtual method may be overridden so that the controller uses a different frame. DisplayContents Displays help window and focuses contents panel. DisplayIndex Displays help window and focuses index panel. GetDialog Returns the current help dialog. GetFrame Returns the current help frame. GetHelpWindow Get the current help window. KeywordSearch Displays the help window, focuses search panel and starts searching. SetHelpWindow Set the help window to be managed by this controller. SetShouldPreventAppExit Sets whether the help frame should prevent application from exiting if it’s the only remaining top level window. SetTempDir Sets the path for storing temporary files - cached binary versions of index and contents files. SetTitleFormat Sets format of title of the frame. UseConfig Associates the config object with the controller. wx.html.HF_TOOLBAR: The help window has a toolbar. wx.html.HF_FLAT_TOOLBAR: The help window has a toolbar with flat buttons (aka coolbar). wx.html.HF_CONTENTS: The help window has a contents panel. wx.html.HF_INDEX: The help window has an index panel. wx.html.HF_SEARCH: The help window has a search panel. wx.html.HF_BOOKMARKS: The help window has bookmarks controls. wx.html.HF_OPEN_FILES: Allows user to open arbitrary HTML document. wx.html.HF_PRINT: The toolbar contains “print” button. wx.html.HF_MERGE_BOOKS: The contents pane does not show book nodes. All books are merged together and appear as single book to the user. wx.html.HF_ICONS_BOOK: All nodes in contents pane have a book icon. This is how Microsoft’s HTML help viewer behaves. wx.html.HF_ICONS_FOLDER: Book nodes in contents pane have a book icon, book’s sections have a folder icon. This is the default. wx.html.HF_ICONS_BOOK_CHAPTER: Both book nodes and nodes of top-level sections of a book (i.e. chapters) have a book icon, all other sections (sections, subsections, ...) have a folder icon. wx.html.HF_EMBEDDED: Specifies that the help controller controls an embedded window of class wx.html.HtmlHelpWindow that should not be destroyed when the controller is destroyed. wx.html.HF_DIALOG: Specifies that the help controller should create a dialog containing the help window. wx.html.HF_FRAME: Specifies that the help controller should create a frame containing the help window. This is the default if neither wx.html.HF_DIALOG nor wx.html.HF_EMBEDDED is specified. wx.html.HF_MODAL: Specifies that the help controller should create a modal dialog containing the help window (used with the wx.html.HF_DIALOG style). parentWindow (wx.Window) – This is an optional window to be used as the parent for the help window. a .hhp file; an HTML Help Workshop project file) into the list of loaded books. is possible and is the recommended way. bookFile (string) – Help book filename. It is recommended to use this prototype instead of the one taking URL, because it is less error-prone. showWaitMsg (bool) – If True then a decoration-less window with progress message is displayed. See the other overload for additional info. bookUrl (string) – Help book URL (note that syntax of filename and URL is different on most platforms). This protected virtual method may be overridden so that when specifying the HF_DIALOG style, the controller uses a different dialog. This protected virtual method may be overridden so that the controller uses a different frame. Displays help window and focuses contents panel. Displays help window and focuses index panel. Returns the current help dialog. Returns the current help frame. Get the current help window. Displays the help window, focuses search panel and starts searching. Returns True if the keyword was found. Optionally it searches through the index (mode = HELP_SEARCH_INDEX ), default the content (mode = HELP_SEARCH_ALL ). KeywordSearch searches only pages listed in ".hhc" file(s). You should list all pages in the contents file. Set the help window to be managed by this controller. This makes it possible to have a help window that might not be in a wx.html.HtmlHelpFrame or dialog but is embedded in some other window in the application. Be sure to use the wx.html.HF_EMBEDDED style in this case. Sets whether the help frame should prevent application from exiting if it’s the only remaining top level window. enable (bool) – If True, the application will not quit unless the help frame is closed. Default is False, i.e. the application does exit if only the help window remains opened. Sets the path for storing temporary files - cached binary versions of index and contents files. These binary forms are much faster to read. Default value is empty string (empty string means that no cached data are stored). Note that these files are not deleted when program exits. Once created these cached files will be used in all subsequent executions of your application. If cached files become older than corresponding ".hhp" file (e.g. if you regenerate documentation) it will be refreshed. Sets format of title of the frame. Must contain exactly one “%s” (for title of displayed HTML page). Associates the config object with the controller. If there is associated config object, wx.html.HtmlHelpController automatically reads and writes settings (including wx.html.HtmlWindow‘s settings) when needed. The only thing you must do is create Config object and call UseConfig . If you do not use UseConfig , wx.html.HtmlHelpController will use the default Config object if available (for details see wx.ConfigBase.Get and wx.ConfigBase.Set ).